While the presidential mandate to form a coalition will only be given next week, the negotiations towards assembling a coalition have begun. The various parties are making their wish lists and faction members are already preparing themselves for serving in various ministries and Knesset committees. Based on the assumption the Yesh Atid party is not in the coalition, MK Yaakov Litzman hopes to retake control of the Health Ministry. In the 18th Knesset he served as the deputy minister of health with the authority of a minister. At present, the ministry is run by Minister Yael German of the Yesh Atid party. 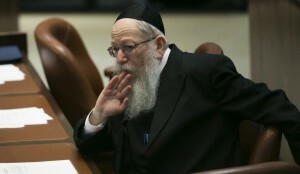 Officials in Yahadut Hatorah have already floated the rumor to the media that entering the coalition will be conditional to Litzman receiving the ministry. The entire election process did not bring out the best in our haylige machaneh. Hopefully this process will: although none of us are naive! Dental care should be added to the package of basic health services for both children and adults. Things like dental crowns, implants, and false teeth are expensive often thousands of shekels. The benefits could be made contingent on watching a video on oral hygiene and taking a short quiz if a formal course on Health has not been taken. Also eyeglasses, orthotics, and prosthetic devices should be added to the basket also. It can be financed by a graduated fee structure with those making over $100,000 a year paying more. So Yahadut ha-Torah will enter the government in return for patronage, even if the government is going to attempt to conscript massive numbers of yeshiva students and end up throwing thousands of them in prison????????????? Not likely. So the condition for entering the government is cancellation of the conscription plan. With the change, Yahdut ha-Torah won’t be able to support the government, and in return for the change they will settle for less patonage. Remember they have minimal clout since Netanyahu has the option of including Lapid, who will a bit less demanding out of gratitude for seeing yeshivos being closed and its students dragged away. Yeh, and my son wants a new Ipod. How is it that the same people are always in the same slots in each Party? Doesn’t any of these people EVER retire? Why don’t they “rejoin” the private sector? Are any of them lawyer’s, doctors, accountant’s, melamed, etc…? Is the pay, in the Knesset, that great? Why isn’t there “term limits” in the Knesset? Why can’t the citizens of Israel vote for the Party they align with, but have some new faces to represent them? That’s no democracy. Akuperma is obsessed. He has written about 50 comments on the conscription issue. He is trying to pretend its the issue of the day that is driving the whole coalition process, in order to feed into his neturei karta fantasy of a chareidi-arab alliance chas vesholom. Lets make a few things clear here to dispel some of his false notions. Although the conscription issue is an important one, it is not the most important one, and not even for the chareidi parties. The number one issue in this election is the security of the yidden in eretz yisroel. Thank hashem that labor lost and the nightmare of having arabs in the government is no longer with us. Any jew who would sell himself to such an alliance for the sake of anulling the conscription laws, would be sacrificing jewish lives. Only a neturei karta person can concoct such a bizarre scenario. As to your premise that its easier to get the conscription laws anulled with a left wing government, than a right wing one, that too is false. The right wing is not looking to fight chateidim. Netanyahu doesn’t hate chareidim . The reason it passed in the previous government was because of one person. That is lapid. His party was much larger than it is now and he held netanyahu hostage and forced his hand. Therefore, out of expedience, netanyahu and benett went along with it. It was not a conspiracy of the right wing against the chareidim. Bibi cant stand lapid and would much prefer to work with the chareidim , than lapid. However, in the previous government the chareidim didnt have the numbers to give him a coalition, and so he begrudgingly took in lapid. Now that lapid is out, the conscription issue, is a non issue. The chareidim are not concerned about it, because they know that they will be able to work out a deal that they are comfortable with, even if lieberman is in the government. That is why you dont hear them talking about it any longer. The only one talking about it all the time is Akuperma. Give it up. Your fantasy of an Arab government chas vesholom will not happen. We need a strong government who will stand up to our enemies, and also to our anti semitic president of United States of America.